It has been a busy couple weeks on the home front. I actually went back home for a couple days last week and then again over the weekend. My Mom had knee surgery and my brother also had surgery last week.......he fell and tore his achilles tendon, ouch!!! They are both doing as good as expected. It will just take some time, a lot of therapy and they will be up in at it in no time at all! I have been a busy bee working on some projects for a few upcoming commitments along with decorations for my daughter in laws baby shower which is this weekend. Once that is behind me, I promise I will have some free time to stop by and visit again!! I have a project to share today that I created for some fun challenges that are going on that I wanted to join in on the fun :) I used some of my favorite Jaded Blossom stamps and dies on this fun treat! I created this adorable treat using Jaded Blossom's Gable Boxes and filled it with fun little candies. I decorated the chocolate kisses with Sassy Candies and Birthday Candies stamp sets. So many cute sayings in these sets! 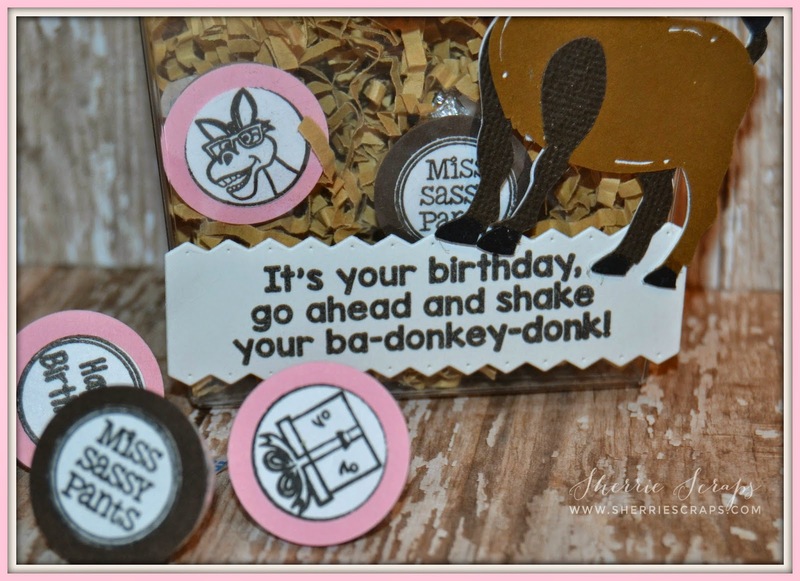 The cute sentiment is from Party Animal and stamped onto a candy wrap using the Candy Wrap Die. Isn't this just the perfect sentiment, lol! 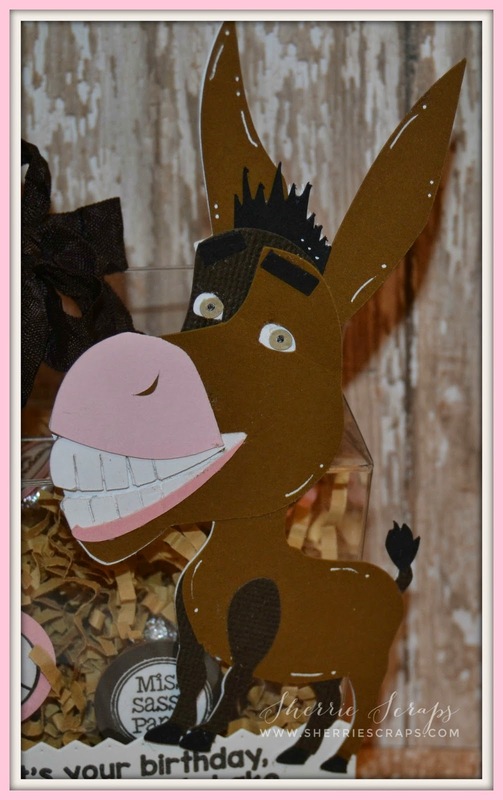 The fun smiling donkey is from SVG Cutting Files. I inked around the edges for a little dimension and added a little doodling :) I love that big grin, hehe! Be sure to come back on May 3rd as I am Guest Designing for the month of May for Jaded Blossom. I will be starting off with a fun project for the monthly challenge that begins that day :) If you want to join April's challenge, that is still going on, go HERE for the details. And then later that day, come back to help celebrate Jo's Scrap Shack's 3rd Blogaversary Blog Hop!! There will be a lot of inspiration and a fabulous birthday giveaway for some lucky person! Oh Moy gosh, Sherrie, this is so stinkin' cute. Your donkey is super ,I love the colors. Great gift idea. Thanks for joining my DL.ART April linky challenge. Have a blessed day, DIANA L.
Cute, cute, cute. Love the face on the donkey! AWESOME job with your sweet treat holder Sherrie, LOVE IT!!! Thanks for joining us in the challenge at Jaded Blossom !!! Haha this is perfect! Love it!! Great job. Thanks so much for joining us over at Jaded Blossom! Goodness, how adorable, you make the cutest things!! LOVE!! It made me laugh, I just love donkey and his silly face! Oh this is super cute! Sorry to hear about your mom and brother...and congrats on the soon-to-arrive new grand baby! Glad to hear that your mom and brother are on the mend. OMG!!! Sooooooooooo cute cute cute! I love love love that song and that donkey!! And hoping the family is back up and feeling better soon!!!!!!!! 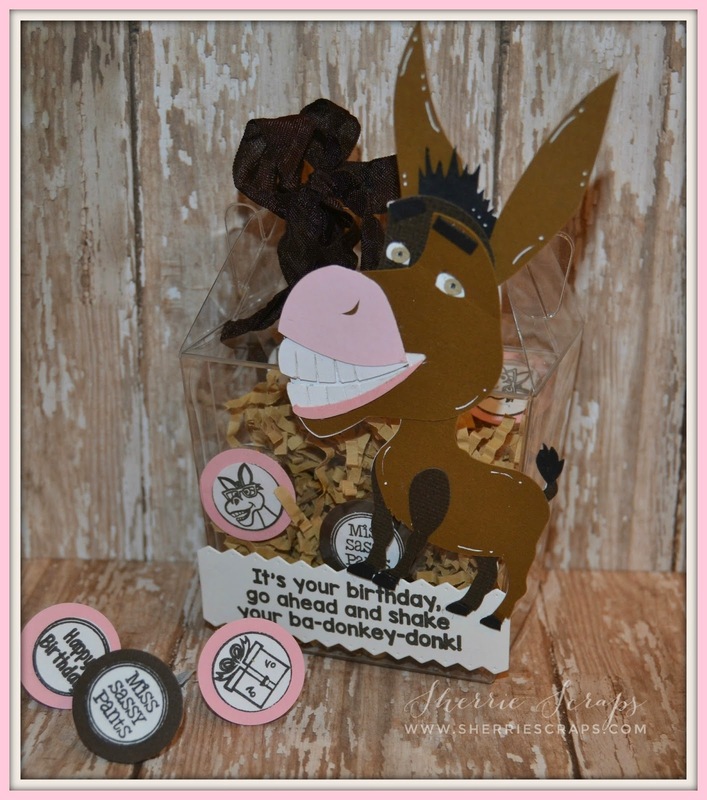 Super fun project, that donkey is just adorable! You've had a lot of family stuff going on, hopefully everyone is on the mend! And congrats on your soon to be here grand baby! Super cute Sherri. hope all is well up north. So super cute. Thanks for joining the JB Challenge this month. OMG this is so super cute and fun!!!! Love it!! Have a great day. Continued love and prayers for your family, Sherrie! Your project is adorable! The image is such fun and I love the sentiment! Sweet detailing throughout, as always! Wonderfully done, my dear friend. :o) Have a blessed weekend! Sherrie I about died laughing from looking at this donkey!!!!! He is so funny and reminds me so so much of the donkey in Shrek!!!! Oh how funny he is and i just LOVE him!!! Your treat box and your sweet candy makeover looks awesome!! And I am so sorry to hear about your mom and brother going through some pain and down time from surgery. I really do hope they both bounce back quick and recover nicely. Please let me know how the baby shower goes!!!! So excited for you to have another granddaughter coming soon! And looking forward to Sunday's hop! heehee how totally fun is this.. thanks for the small..
Oh my gosh, so darn adorable!! I can't quit smiling!! That grin is fabulous!! And ha - the sentiment!! It's perfect!! What a fun gift this is!! I love, love it!! How fun is this project! 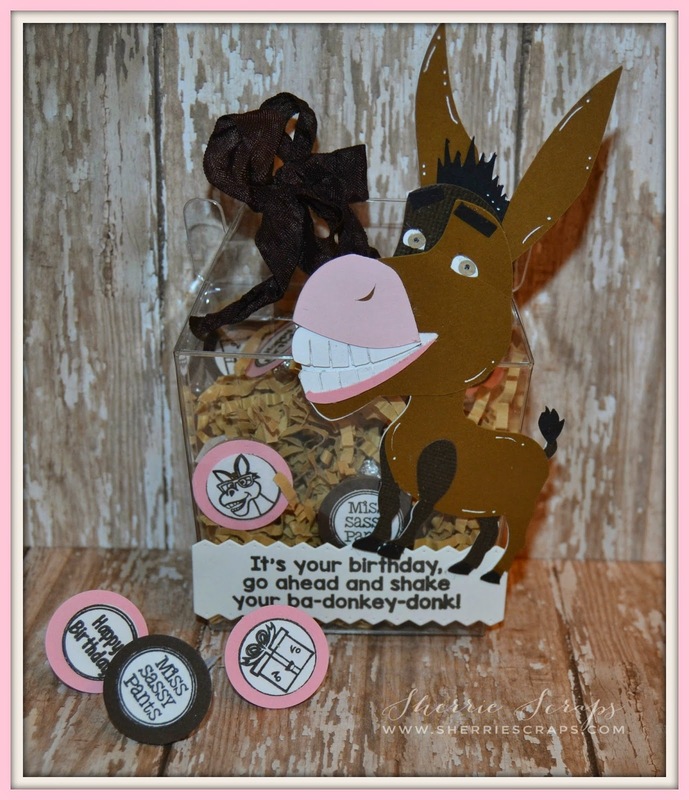 Love the donkey and the big teeth : ) And, the sentiment is so cute!!! Hoping all of your family members recovery goes smoothly and quickly! Thanks so much for joining us at the Sweet Stamps Anything but a card challenge! this is so FUN !!! great job ! gotta love that donkey lol ! thanks so much for joining us in the Jaded Blossom challenge !! OMG! I cannot stop laughing..This is beyond CUTE..LOL! Super DUPER cute!! Love those big teeth!The JB sentiment is too cute!! Love! Love! Love! Fun treat my friend! LOL!! This is so FUN!!!!!!!!! LOVE that donkey! Yikes! You're busy - but seem to be pulling everything off with a positive attitude. Best of luck to your mom and brother. I hope they're doing much better. Your box just made me LAUGH!! Love the donkey with his big grin. Such a FUN sentiment too! Oh my gosh it's DONKEY from Shrek! My favorite! I'm in love I have to get this file!!! Sherrie, this is just the cutest EVER! The stamps are awesome and the sentiment is FABULOUS!!! So glad to hear your Mom and bro are doing better! Have a SUPER day! Oh my goodness these are way too cute cute Sherrie!! Thank you for joining us over Decorate to Celebrate.